Sunrise over Klamath Marsh, south-central Oregon. Click on image for purchase options. It is that special day today, Summer Solstice! It’s the longest day of the year and the first day of summer for the Northern Hemisphere. For all you Southerners it’s Winter Solstice, the shortest day of the year and start of winter. For today I’m posting one sunrise, from Klamath Marsh in southern Oregon, and one sunset, from the Pacific Coast just south of the Oregon-California border. Please let me know if you’re interested in fine-art prints of the images here, or want to buy rights to the high-resolution files. They’re not available for free download except with my permission. Please contact me, thanks! You may already know this but the Earth is tilted on its axis about 23.5 degrees. This tilt gives us our seasons, and means as we go around the Sun there are four moments (not whole days) when things line up. In March and again in September there’s a moment when the North Pole is tilted precisely along our path of travel, our orbit, at a perfect right angle to the Sun’s direction. These are the equinoxes, when day and night are equal the world over. In December there’s a moment when the North Pole points directly away from the Sun. In June, usually on the 21st but sometimes on the 20th, a moment comes when the North Pole points directly toward the Sun. This puts the Sun as far north in our skies as it can get. In the Southern Hemisphere it’s low in the sky, leading to short days. In the Northern Hemisphere it’s high in the sky, leading to long days. In the far north above the Arctic Circle, where I spent a couple summers a long time ago in Alaska, the Sun never sets at this time of year. It skims along nicely above the northern horizon throughout the wee hours. I went on several long hikes in the Brooks Range when I was up there working. I’m a person who needs darkness to sleep, and I was having trouble staying asleep. So I used the time to see the midnight sun trace its path across the sky above the Arctic Plain. Our encampment was down in a valley with a fairly high ridge to the north, so you couldn’t see the midnight sun for about 8 full hours. It took about an hour and a half to climb the ridge, and I”m sure it would take twice that long for me now! In good weather there was a clear view out to the Chukchi Sea to the west, the Noatak River Valley to the north. The glowing sun glided not far above the horizon. I recall seeing a few grizzlies on their rounds down below. I never ran into one close, but being alone I was cautious. I avoided obvious passes and other places a bear might use to cross from one valley to another. So enjoy our long days all you fellow Northerners. If you live relatively close to the equator, I’m sorry but all this talk of seasons and change is a bit lost on you. But heck, go ahead and celebrate with the rest of us! The rugged Pacific Coast of far northern California witnesses many a fine sunset. Click on image for purchase options. A beautiful sunrise over the Columbia River Gorge, with Beacon Rock just visible through the mist. I’ve been sort of fixated on photographing the crescent moon lately. I wanted to capture it at sunrise (i.e. when it rises just before the sun on the day or two before new moon), but clouds interfered. Instead I got a pretty nice sunrise shot (see image above). Then I set my sights on the setting crescent after new moon. Coincidentally, this moon when it is first sighted marks the beginning of Ramadan, the month of daily fasting & prayer for muslims worldwide. On the day after the new moon, the crescent was exceedingly thin, only 5% illuminated. Further complicating matters, it was due to set less than half an hour after the sun. These factors make it very difficult to sight. You can make it easier by getting up in elevation with a clear view of the western horizon, and scanning with binoculars. I almost went this route, but I wanted a different sort of picture of it. I wanted some interesting foreground that included water. So I set up at river-level in the Columbia Gorge near home. While sharp-eyed muslims sighted this moon and Ramadan began, I failed. A photo captured at dusk but with something missing – the crescent moon. I was disappointed but not beaten. The next evening I knew the crescent would be easier to sight and probably make a more beautiful picture. I went back to the same spot in the Gorge, Rooster Rock State Park. The image at bottom was the result. Hope you enjoy it. If you’re interested in any of these images, just click on them. They are not available for free download without my permission, sorry. Go ahead and contact me if you have any questions. By the way, I wrote a post on capturing the crescent moon (with a photo not a lasso!). Check it out. Thanks for the visit! Success! A peaceful crescent moon sets at dusk over a small inlet of the Columbia River, Oregon. The summer solstice happened very close to the time of the full moon at perigee, here at Lost Lake. Yes I realize it is several days after the solstice, but I don’t want to wait 6 months to publish this. It seemed to me significant that we had both the solstice and a full moon at perigee (“supermoon”) in the same week. I’m an astronomy nerd, so the motions of the sun, moon and planets mean something to me. It’s not just about your sign! I think the solstices are the most important days of the year, with the equinoxes a close second. I still like Christmas a lot, but that’s just the winter solstice a few days after. Last week, one of the year’s two solstices took place. For us in the northern hemisphere it marked the first day of summer, the longest day of the year. It happened in the evening on the west coast of North America. Like all astronomical phenomena, solstices (and equinoxes) happen at a specific time not on a date. 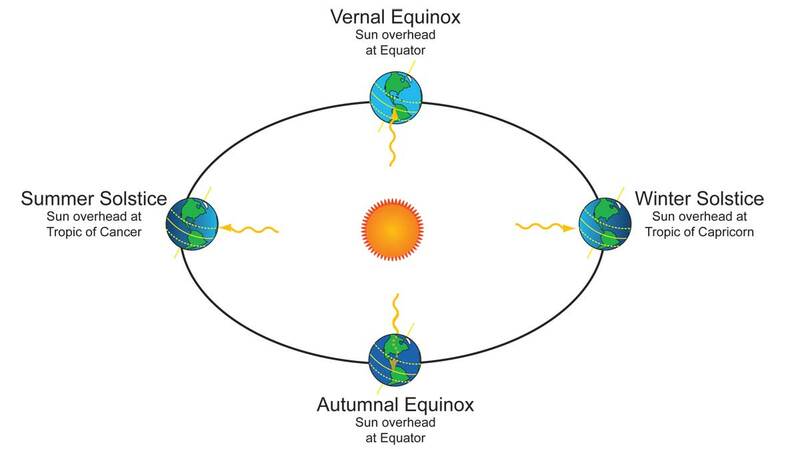 In the case of the solstice, it is the moment when the earth points its axis directly toward or away from the Sun. For the northern hemisphere, the summer solstice is when our planet points its northern hemisphere at the sun, at the sharpest angle it can. Therefore for most of the world’s population this signifies the longest day and shortest night of the year. Stonehenge was supposedly built to mark the solstices. This is a replica of the famous megalithic ruins. It is in Washington state. For the southern hemisphere, the situation is the same but opposite. The summer solstice for the northern hemisphere, which happens either on the 20th or 21st of June every year, is the winter solstice for the southern hemisphere. Folks in South Africa and Australia have their shortest day and longest night while people in America and Europe have their longest day and shortest night. The year’s other solstice occurs in 6 months, on December 20th or 21st. The northern hemisphere is pointed away from the Sun, and thus has its shortest day and longest night. The southern hemisphere has its longest day and shortest night. Short nights around Christmas? I really don’t like the thought of that. This post is a good excuse to post an abstract, relatively rare for me. The planet we live on is tilted on its axis of rotation. Therefore it must tilt toward or away from the Sun as it revolves around it. If you are good at visualizing, you know that there is a time (two times actually) when during the year the Earth neither points toward or away from the Sun. Those times are known as the Equinoxes. Nights and days are equal. Think of those times as when the Earth is tilted directly toward or away from its direction of its travel around the Sun. Okay, so why is this stuff important, or at least very cool? The nature of time, the seasons, the passage of our lives: to me these have always been very profound & interconnected things. When I was younger, the seasons meant warmth, colorful leaves, cold and snow, and flowers, and that’s all. But as I learned about things astronomical, the other pieces fell into place. Add all the fascinating myths and stories from around the world and I realized I was not the only one who thinks these matters are important. Surprising tulips appear randomly along Washington’s Klickitat River, well away from any habitation. Connections between things that happen in the world have always interested me. You will occasionally see TV shows and books dedicated to these ties between natural events and human stories and experience. Unfortunately these are too often academic and dry. This I can’t understand, since these events have inspired so much that is creative in humans: poetry, art, stories. I like the way people respond and react, both emotionally and in a visceral sense, to these cycles. I definitely react to them, and I like this very real connection to the natural world that I share with others. I guess that’s why I think the solstice is worth celebrating. Rhododendrons bloom in June in Oregon’s forested Cascade Mountains. I should admit right here that I did nothing special to signify the event. It snuck up on me. I have in the past celebrated by climbing a mountain and camping atop it, or by joining in some extended outdoor excursion or even party. But this time it just passed, and like with birthdays I just felt older. Enjoy these images. I’m sorry but they’re copyrighted and not available for free download without my permission. Just click on any you are interested in to go to purchase options for the high-res. version. Please contact me if you have any questions. Thanks! The so-called supermoon, the full moon at perigee, rises over Lost Lake, Oregon as a beaver swims by. Dusk comes very late in Oregon’s Columbia River Gorge at summer solstice. The moon sets behind the Tetons as the Milky Way soars over Jackson Lake, Wyoming. I have neglected this series for far too long, I’m sorry to say. Check out the previous posts for some background and for some of my best starscape images. Part I discusses how science has tackled the biggest questions we ask about the Universe and how life fits into the picture. Part II continues by touching on the idea of the universe having a consciousness, or even some sort of creator; it also discusses how quantum theory fits into things. Part III goes into what we know thus far about life’s origins. And Part IV highlights the incredible progress we’ve made in the exploration of our solar system, with the not always explicit goal of finding life on other planets. The progress of this series has been generally outward, from our beloved Earth (which remains the only place we know that hosts life) and out to the solar system. My goal (at least metaphorically) is to go out to the stars, our galaxy, then finally the larger Universe. Then I’d like to come back to the original two-part question discussed in Part I: how did we come to be and why? In this post however, I’m going to take a short detour and speak about a scientist who greatly influenced how we have tackled these questions. He is Carl Sagan, an astronomer from the United States. Now passed away, he was widely known as a popularizer of astronomy. He influenced NASA policy along with millions of people who watched his Cosmos TV series. He had a significant effect on me. In Little Ruin Canyon the moon illuminates Square Tower, with Hovenweep Castle visible on the rim beyond. While he was charismatic and very good at getting all sorts of people enthusiastic about space science, he was also a very good scientist. Among the general public in the U.S., he was mostly known for going on the Johnny Carson Show and expounding on astronomy. Of course everyone knew that Johnny would eventually get him to say the word “billions”. In Sagan’s landmark TV series Cosmos and in lectures, he often referred to billions (of stars, years, miles) with a definite, purposeful emphasis on the b. With his great voice, the b literally boomed. Comedians of the day had a great time imitating it. Sagan started out as a planetary scientist, studying under the great Gerard Kuiper at University of Chicago and going on to make important contributions. For example, he put together observations from the early Venus probes to demonstrate that the reason our sister planet is an incredibly hot, dry place is that it suffers from a runaway greenhouse effect. He was first to suggest that Jupiter’s moon Europa has an enormous subsurface ocean and that Saturn’s moon Titan is bathed in an organic-rich atmosphere and had liquid organics on its surface. He was a key figure in several important NASA missions, including the Viking robotic mission to Mars. He led a small team that designed humanity’s first (and 2nd & 3rd as well) message to the stars. Carl Sagan and Frank Drake came up with the idea to send messages to the stars on the Pioneer space probes. Pioneer 10 and 11 were launched in the early 1970s to pass close to Jupiter and Saturn and then head out of the solar system into outer space. These space-ready plaques, these cosmic messages in a bottle, had very simple messages inscribed on them. There was a map showing where our solar system was located, along with figures of male and female human beings waving a greeting. Five years later, the Voyager probes (which are now passing into interstellar space) carried a much more involved package. It included a gold-plated record of pictures plus sounds from Earth (music, frogs croaking, volcanic action, human greetings in many languages, etc.). This time capsule was designed by a team led by Sagan. Also, in 1974, Carl Sagan and Frank Drake sent for the first time in human history a deliberate radio message out to the stars. Aimed at the enormous globular cluster in the constellation Hercules, it was a coded radio transmission sent from the huge Arecibo dish in Puerto Rico. It was not approved or sponsored by NASA, and drew great criticism. Some prominent astronomers complained that it was arrogant and stupid for Sagan to advertise our presence to potentially hostile aliens. Sagan countered that we have been broadcasting into space for generations, though the messages which continue to be broadcast (radio programs, TV sitcoms, etc.) may not be putting humanity’s best foot forward. Wandering around Monument Valley during a full moon is a special experience. Carl Sagan believed deeply in both the existence of extraterrestrial intelligence and in the many benefits that contact with them would provide humanity. Do not misunderstand, however. He was not a believer in ancient aliens or even that UFOs were evidence that we are being visited in recent times. He simply believed that life had not only gotten started in many many places throughout the galaxy, but that it had progressed far beyond our level in a significant number of star systems. He believed that if we made contact with any aliens, it would be near certain that their technology and culture would be far more sophisticated than ours. This makes perfect sense if you believe that the Drake Equation (which estimates the chances of extraterrestrial intelligence) strongly suggests there are very many instances of intelligent civilizations in our galaxy. Sagan combined that conclusion with the Fermi Paradox. In 1950, Enrico Fermi famously asked of his colleagues (including Edward Teller, the father of the hydrogen bomb) “where are they?” If there are so many potentially life-friendly star systems and literally billions of years to play with, why haven’t we seen any evidence of aliens, present or past? Sagan took these two factors, plus the fact that we are in the infancy of space exploration ourselves, and concluded that any civilizations which do exist have somehow avoided having destroyed themselves, and are thus greatly advanced both technologically and culturally. He had faith that we would eventually make contact with an advanced intelligence. He also believed that their success in handling increasingly sophisticated, potentially destructive technology meant that they would be peaceful and non-aggressive. Further, he thought they could teach us how to avoid destroying ourselves through technology, wars or ecological collapse, and that this would be the greatest discovery in the history of humanity. This is why in the latter part of his career he focused intensively on making contact with extraterrestrial intelligence, and on convincing the general public that this was a worthwhile endeavor. Some criticized this belief as not only quasi-religious, but as out-of-date and quasi-colonial. They thought Sagan’s beliefs smacked of the justification for imperial powers of the west conquering primitive peoples in order to provide them with the benefits of the modern world (all the while stealing their resources and infecting them with disease). In this cosmic case, those backward beings would be us Earthlings, and the “benevolent” conquerors would be extraterrestrials. Many people who think about this stuff believe that contact with aliens would bring a similar fate: exotic disease, theft of the Earth’s resources, and similar bad outcomes. I think this criticism of Sagan is unfair. A full moon illuminates Ship Rock in New Mexico. The movie Contact is based on Sagan’s book of the same name, where SETI’s Jill Tarter (played by Jodi Foster) makes first contact with aliens. SETI (Search for Extraterrestrial Intelligence), the effort that Frank Drake, Guiseppe Cocconi and Philip Morrison started is now a very mature organization. Basically an effort to detect alien transmissions, SETI was kept alive during the 1960s by the Russians. Carl Sagan, during the Cold War, collaborated with the Russians on SETI. Now an American organization run by Seth Shostak, with both Frank Drake and Jill Tarter still involved, SETI is carried out by an international cast of scientists. They conduct highly sophisticated monitoring of our galactic neighborhood. Still looking primarily for alien radio transmissions, SETI incorporates sophisticated computer-assisted arrays of telescopes and also looks for optical signals (such as messages carried on laser beams). Carl Sagan has been criticized for his almost religious zeal and optimism surrounding the existence of life on other planets. He was very adamant that cameras on the Viking Lander be capable of sweeping the area in case any intelligent creatures show up to check out the intruder. He endorsed a theory by the Russian Iosof Shklovsky which proposed that Phobos and Deimos (the two small moons of Mars) were artificial satellites created by Martians to escape a deteriorating climate on the planet’s surface. Regarding the controversial “face” on Mars, Sagan parted ways with mainstream astronomers when he supported further study of it. But he believed it was probably natural, a fact that was confirmed during subsequent flybys. Sagan has been likened to that controversial icon of early 20th century Mars exploration, Percival Lowell. Lowell was the dogmatic scientist who was convinced up to his death that Mars was laced with canals. Sagan criticized Lowell for his refusal to accept evidence against the canal theory, but it is said secretly admired him for his belief in intelligent Martians. Lowell was a tireless promoter of the theory for an advanced Martian society and, at least in part, so was Carl Sagan. I think it’s a stretch, however, to label Sagan as Percival Lowell’s successor. The full moon as viewed through a translucent veil formed by geothermal steam at Firehole Lake in Yellowstone National Park. While it’s true that Carl Sagan had a strong belief in alien intelligence, possibly nearby, I regard him as a very good scientist, a straight thinker who could never ignore evidence that contradicted his beliefs. He famously said “Extraordinary claims require extraordinary evidence.” Although he though the study of UFOs was a legitimate effort, he debunked the famous alien abduction of d considered the chances of alien visitation to be extremely small. For years he taught a course at Cornell on critical thinking. But there’s no getting around the fact that Sagan’s interest in astronomy was stoked at an early age by the science fiction of H.G. Wells and Edgar Rice Burroughs. Sagan was a well-trained astronomer who had a huge diversity of scientific interest and knowledge. I have read quite a few of his books, and they are diverse. Cosmos, The Pale Blue Dot, Cosmic Connection, Comet and Intelligent Life in the Universe are all great astronomy reads. But he also wrote The Dragons of Eden, which explores the evolution of human intelligence. Shadows of Forgotten Ancestors, about human evolution, is a fascinating book. He worked for some years with famous biologists and geneticists, including Harold Urey and H.J. Muller. He also worked with famous physicist George Gamow. In a book called Demon-Haunted World, he defends science as a way to counter the chaos and misery of totalitarianism and war, along with ignorance. The starry sky on a clear evening is reflected in the aptly-named Reflection Lakes at Mount Rainier National Park in Washington. In eastern Washington state stands a replica of Stonehenge, here viewed just before complete darkness descends with the stars coming out. Sagan was in some ways a child of the 1960s. He was strictly anti-war, a staunch environmentalist, a believer in a woman’s right to equality and access to birth control (including abortion). He smoked marijuana, and did little to hide the fact. He married three very talented, intelligent and strong women throughout his life. I believe Sagan’s most important legacy is what he did to make astronomy (and science in general) understandable and exciting to the public. Sagan really believed science was a spiritual quest, but not in the strictly religious sense in which the word spirituality is often used. Many people think his belief in extraterrestrial intelligence had strong religious elements. But I think that he simply wasn’t conflicted about his science, and that he really was agnostic. I believe that many of his critics mistook his spiritual-like enthusiasm (especially evident when he talked to the public about science) for some sort of religiosity. Carl Sagan died in 1996 from pneumonia (of all things). It was related to a disease he had called MDS, a condition that destroys a person’s bone marrow. He was only 62, with plenty more to contribute to science and society. Among many scientists and science enthusiasts, and nearly all science educators, he is sorely missed. The movie Contact, an adaptation of his novel, came out in 1998. If we do make contact with intelligent aliens within what would have been his natural lifetime (to the late 2020s, say), it will be a true shame he did not live to see it. An old abandoned schoolhouse out on the Oregon prairie is illuminated by a crescent moon. The Milky Way glows pink in the coming dawn. Getting good shots of the crescent moon is a bit different than shooting the moon at any other time. In this Friday Foto Talk we’ll discuss some of the considerations during capture, as well as the way I process the images. The crescent is certainly a worthwhile subject. Especially when the moon is very new and a thin crescent is illuminated, it can be a very delicate and beautiful feature of the evening or early morning sky. A thin crescent moon over the Columbia River, Oregon. Composite of two images: Background – 110 mm., 30 sec. @ f/11, ISO 400; Moon – 200 mm., 3.2 sec @ f/4, ISO 400. First off, when can it be shot? Well, assuming your goal is to capture it when it is very thin, you will be shooting just after sunset or just before sunrise. This makes sense if you think about why only a thin crescent is illuminated. To get a good idea of this concept, go get an orange, tennis ball, or any round object you can hold in your hand. Hold it up between you and a bright light bulb (without a lampshade). Move toward the light so that when you hold the ball at arm’s length it just covers the light bulb when you close one eye. Move your arm so it’s held out to the side, forming a right angle between yourself and the light. Look at the ball. It’s half-lighted. This is a half-full, a first or last quarter moon. Now swing your arm slowly toward the light and concentrate on the lighted part of the ball. It should approximate a crescent shape that gets smaller and smaller until it is a small crescent before it completely covers the light (representing a new moon). Now you have an idea of the position of the crescent moon relative to the earth (your eyes) and the sun (the light). When the ball/moon is moving toward the light/sun it is a waning crescent, visible in early morning just before sunrise. When it is moving away from the sun it is a waxing crescent, visible in the evening just after sunset. In either case the moon will be near the horizon, and so it represents a good opportunity to make an image with a pretty landscape beneath the moon. You will also have the opportunity to shoot it at so-called blue hour (the time when the sun is below the horizon but the sky has enough light to give it a deep blue color). You will also not have as much contrast between the bright moon and the dimmer sky or landscape as you do when more of the moon is illuminated. The crescent moon decorates the dusk sky behind a towering cirios (boojum) in the Baja California Desert, Mexico. Last night I shot the crescent moon at just under 2 days old. Since I wanted it close to the horizon, it was the very end of blue hour. So there was some contrast to deal with. As with shooting the full moon, it helps to have a fairly bright or reflective landscape in front of the moon. Deserts are good, but water is just as nice. I had been shooting the sunset over the Gorge at popular Crown Point, and on the way home I drove right by the Columbia River. I found a favorite spot of mine to shoot near the river, and quickly set up. There was not much time. Since I do not like to use high ISO when I am shooting low-light images like this, I let my exposure go up toward 30 seconds. This was also necessary because of the fact I had foreground elements not far away, in the form of some pilings sticking up out of the river. This made it necessary to use an aperture that gives good depth of field (i.e. f/11). Even if I had raised ISO and dropped my aperture to f/5.6 or so, the darkness of the scene would have given me exposures on the order of at least 5 or 6 seconds. A beautiful summer evening in Portland, Oregon features the crescent moon. And therein lies the challenge. If you shoot the moon at a shutter speed of more than about 3 seconds, it will begin to blur. This of course is because of the Earth’s rotation. My shots at 30 seconds, which were perfect for the sky and river foreground, featured a moon that was completely smeared out. Yuck! My solution in this case was to shoot a frame where I zoomed in as much as my lens would allow (200 mm.). I dropped my aperture to the maximum opening (f/4) for my lens. I used Liveview to view the moon close-up while I focused it perfectly. Then I shot it at an exposure of 3.2 seconds at f/4 with an ISO of 400. When I’m shooting the moon, I always look for compositions that are effective (balanced, attractive, etc.) at longer focal lengths. Of course sometimes the best composition is a wide-angle, but the moon will be small in those cases, very small. Longer focal lengths make the moon bigger. It is really a trade-off. The image I finally decided on (I shot several) had a focal length of 110 mm. and included some nicely illuminated clouds along with the silhouetted pilings. Now I had two images: one with a sharp, beautiful blue-hour rendering of the river and sky but with a badly smeared-out moon; and a second of the (sharp) crescent moon alone. I knew I would be combining the two images in a composite during post-processing (explained below). By the way, this image (top of post) shows almost unnaturally bright yellowish clouds. They are that way mostly because of the reflection of nearby Portland’s street lights. In this evening image from Zion National Park, a fat crescent forms a minor supporting element.. I used Lightroom to make basic adjustments to both of these images. I had to brighten things a bit, which is not ideal, since it increases noise. Better would have been to capture the moon at an earlier stage. The perfect stage for this moon, at least to shoot it at blue hour, occurred when it was just over one day old, which occurred during daylight hours. Photographers on the other side of the world had it perfect! I also did some sharpening and noise reduction in Lightroom. You can also use Adobe Camera Raw, Aperture, GIMP or your camera manufacturer’s RAW processing software. Using the wider shot with the long exposure as the background layer, I copied that layer and then used the clone tool to remove the blurred moon. I remembered its position using the ruler guides in Photoshop. I then went to the shorter-exposure moon image and used the quick selection tool to select the moon. I copied this (ctrl/cmd C) and went back to the background image, hitting ctrl/cmd V to paste it on. This gives you two layers, the background and the moon. Since I had zoomed in on that moon image, it looked too big. * Hitting ctrl/cmd T to change its size and position, I dragged it’s corners to shrink back down to the original size. Finally I dragged the moon to its correct position. I adjusted this moon layer using Photoshop’s levels and hue/saturation controls (enhance menu) until it matched the background and looked similar to the way I remembered it. I’ve found this step to be almost always necessary. It takes some practice to get the moon to look like it belongs. It will be easier if in Lightroom you adjust white balance identically for both of the images. Lastly, I went around and checked the image for distracting sensor spots, bright lights and other distractions. I left all of the artificial lights in the small community across the river from where I was standing, but I did remove the lights of a plane. * Note: Some photographers will leave the moon bigger than its original size, or even use ctrl T to make it bigger. You see these images all over the web, and I think they look FAKE! I recommend keeping the moon at the original size, or very close to it. The human eye knows that a wide-angle scene with a big moon is not natural. If you want a bigger moon, shoot with a longer focal length. I hope you enjoyed this little tutorial. Don’t worry if you are not yet comfortable with Photoshop. I consider myself a novice with it, and the way I do these types of composites is fairly simple. Don’t let it intimidate you. There are undoubtedly other ways (perhaps simpler ways) to accomplish the same thing with Photoshop. If you cannot afford Photoshop, consider Photoshop Elements, which is much much cheaper. Elements will do all of the steps listed above, and do them just as well as the full version of Photoshop. For the initial adjustments, you can use free programs like GIMP instead of Lightroom or Aperture. A few last thoughts: shooting long exposures after sundown is something I think every photographer will enjoy. Including the moon can only add impact to your pictures. Again, make sure it’s a sharp and natural-looking moon. Click on the images for options to purchase larger high-res. options. They are not available for free download, being copyrighted (these versions are much too small anyway). Thanks for your interest, and thanks for reading! Lost on a dirt road in central Nevada and the incredibly clear cold air makes it possible to photograph an extremely thin crescent.